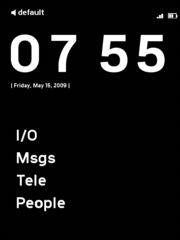 I/O is the phone log. It'll show your dialled, answered and missed calls. why do you name something so fundamentally necessary, with such an obscure name? How do I get Illume? Open settings, click on "display" and then hit "profile" (once) and be patient, after some rumbling on the screen you will have the standard illume look with paroli in windowed mode. Hold the power button down for 10 seconds. It will not give you a visual feedback, it just starts shutting down.